Whole exome and genome sequencing are increasingly used for clinical diagnosis of rare genetic syndromes yet clinicians often overlook critical issues with next-generation sequencing (NGS) that can impact diagnostic accuracy. 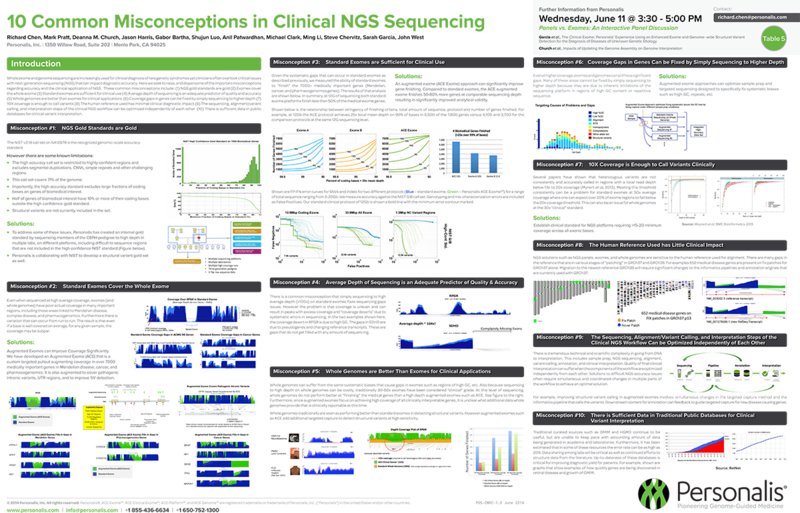 Here we seek to raise, and dispel some of the important misconceptions regarding accuracy and the clinical application of NGS. These common misconceptions include: (1) NGS gold standards are gold (2) Exomes cover the whole exome (3) Standard exomes are sufficient for clinical use (4) Average depth of sequencing is an adequate predictor of quality and accuracy (5) Whole genomes are better than exomes for clinical applications (6) Coverage gaps in genes can be fixed by simply sequencing to higher depth (7) 10X coverage is enough to call variants (8) The human reference used has minimal clinical diagnostic impact (9) The sequencing, alignment/variant calling, and interpretation steps of the clinical NGS workflow can be optimized independently of each other (10) There is sufficient data in public databases for clinical variant interpretation.